Panna Cotta and Compote, where have you been all my life? This week I was watching the Nate Berkus Show’s cooking segment. They were in the middle of cooking something I had never heard of before…Panna Cotta. 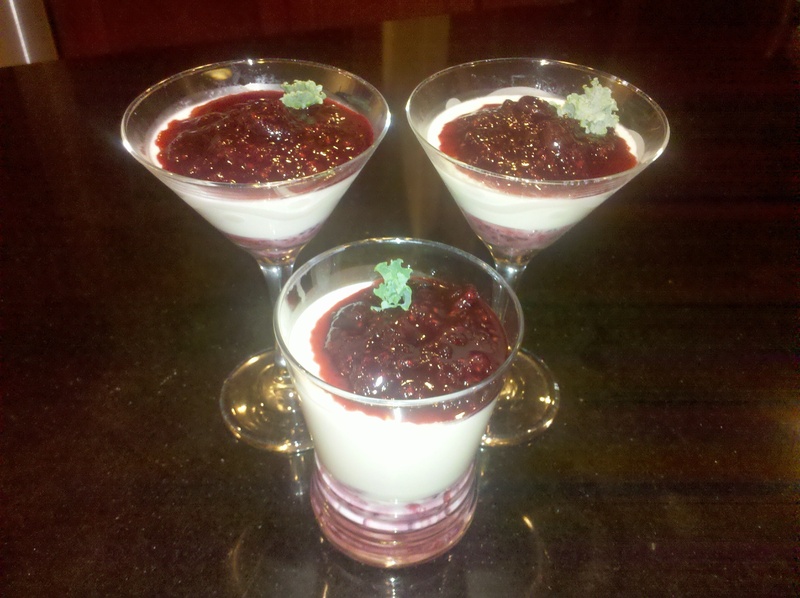 The show’s version was Coconut Panna Cotta with a Mixed Berry Compote (recipe below), and it looked so very yummy. What intrigued me was how easy it looked and Nate’s reaction upon eating it. I decided I would take the challenge to make a dessert that would elicit a reaction akin to Nate’s, so I dove into this challenge last night. The ingredients were easy enough to find, and it did not seem as if I would really have any issues with putting everything together. The hardest part had to be slicing through the vanilla pod and scraping out the beans. Luckily, I still have all my fingers. The next issue occurred when I dropped the lime I was zesting into the hot water and sugar. It was not really an issue until I continued zesting and the lime shot across stove and the counter. I did not think it was going to be that slippery. Well zesting and juicing done and vanilla beans scraped, and it was time to put everything together. I made a few slight changes by adding a little extra sugar to the berry compote and adding a little of the aforementioned compote to the hot coconut milk mixture. The result was that the berries sunk to the bottom before everything had the chance to chill. This beautiful dessert chilled for a few hours and then I added the chilled compote to the top (see photo). For aesthetic reasons, I added a little piece of kale to take a photograph, but it was promptly removed. The result was heaven. The coconut flavoring was not very prominent, but it was a much lighter dessert than I expected. And, yes, Nate was so correct…you can’t stop eating it. Though the family did not give a reaction similar to Nate’s tv reaction, they did like it and asked if I could make a chocolate version. I told them I would do some research, and today, on Twitter, my wonderful friend Joanna found a recipe for Chocolate Hazelnut Panna Cotta topped with Pomegranate Arils that we will share soon! She is so awesome! The ‘low-down’ is that this is a great ‘make-ahead’ recipe and one that is so light, you could serve after a huge bowl of pasta. Just be careful of slippery limes being shot across the kitchen. 1. Set aside ¼ cup heavy cream in small bowl and add powder gelatin to set. 2. In a medium saucepan, combine coconut milk, condensed milk and 1 1/2 cups heavy cream. 3. Mix soaking gelatin into warm coconut milk/cream/condensed milk mixture until dissolved. 4. Strain mixture into shallow parfait glasses, let set/refrigerate 2-4 hours. 1. In a small saucepan combine sugar with water and heat to make simple syrup. 2. Cut and scrape vanilla beans from pod into saucepan. 3. Zest and juice lime into saucepan. 4. Add mixed berries and stir until it forms the compote. 5. Pour berry compote over the panna cotta and serve.